High speed and quality digital printing for cotton, silk, hemp (linen), and rayon. 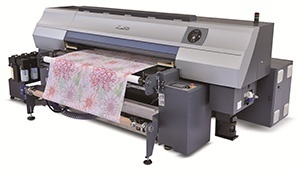 The Tx500-1800B features a conveyor belt system to ensure stable feeding of materials, especially for elastic fabric. The concept of this product is High-speed printing, as it has been with its preceding models TS500-1800 and Tx500-1800DS. Nongranular, high image quality is achieved by variable dot sizes of 7pl and 21pl. A function to reduce banding (stripes in the direction of media feed) during printing is provided.